Sometimes I put down my Guerlains and go for something simpler, something with more simplicity and clarity and during those times, The Unicorn from Black Phoenix Alchemy Lab suffices. Inspired by Alice in Wonderland, The Unicorn is a lovely white floral reminiscent of what a mythological horse with a cone on its forehead would actually smell like. In Bottle: White and ethereal, floral with a very light powdery shimmer. This fragrance smells like a bar of lush soap and a bouquet of freshly picked linden flowers. It’s gentle, airy and a little bit sweet. Applied: That clean white floral scent is the first thing I smell as the linden flowers start to take over the place. I can detect some mild hints of jasmine in this too, I think. It’s an understated jasmine though, just there to give the fragrance a more floral edge. As the dry down starts winding its way into the picture, The Unicorn turns from a pure clean, white floral into a greener, sweeter herbaceous fragrance. Its final stage is marked with powdery white flowers and fresh sweet greenery that smells a bit like parsley. Extra: The unicorn in Alice in Wonderland is a play off of a folk song. If I recall correctly, the unicorn and the lion were representative of England and Scotland, much like the coat of arms of the United Kingdom today. The Lion being England and The Unicorn is Scotland. 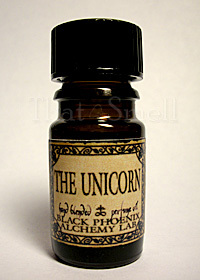 Design: The Unicorn is bottled in the same way most other Black Phoenix Alchemy Lab oils are. Its label is the standard general catalog design. Notes: Linden blossoms, jasmine, sweet herbs. I tend to attribute The Unicorn as more of a soap fragrance than a personal fragrance. But I do love clean, soapy scents. There’s just something very soft and comforting about this scent that would make it a fantastic fragrance for soaps. Reviewed in This Post: The Unicorn, 2009, 5ml Bottle. This entry was posted in black phoenix, floral, Reviews By House and tagged alchemy, alice, arms, black, blossoms, bpal, clean, coat, fragrance, jasmine, lab, linden, lion, perfume, phoenix, review, scent, soap, unicorn, wonderland. Bookmark the permalink. I hate it when my favorite of something gets discontinued! Have you tried BPAL’s “The Last Unicorn” scent? Could that be similar? “Lilac Wood” is floral as well. Or, for a window of 4 hours only, Aug 6th 2-6 p.m. they’re going to have a limited edition scent available to order. I’ve smelled it and it’s sort of a floral musk scent. I haven’t tried The Last Unicorn or Lilac Wood yet. They’re on my list to try though. 😀 I don’t know if they will be similar enough to The Unicorn for me. The linden blossom was what made this pretty fragrance one of my favorites. I still can’t believe they discontinued it :-(. Oh! I had no idea about the August 6th launch. Thanks for letting me know about that, Kat! I’ve got to look that up. I love florals!